The stately Hegeler Carus Mansion is an architectural masterpiece and a key to the rich history of the Illinois Valley, the Midwest and the nation. Virually unaltered since its completion more than a century ago, the mansion is at once a family home, an example of the high artistic achievement in architecture and interior design, and the site of historic accomplishments in industry, philosophy, publishing and religion. The mansion is located near Starved Rock State Park at the western end of the Illinois & Michigan Canal National Heritage Corridor (Only minutes from downtown Utica), was built in 1874-1876 by Edward C. Hegeler, partner in the Matthiessen and Hegeler Zinc Company. The mansion also housed offices of Open Court Publishing Co., one of the earliest academic presses in the country, founded by Hegeler in 1887. Under the leadership of Paul Carus, Hegeler’s son-in-law, Open Court became among the earliest American publishers to produce English translations of oriental religious texts. As a young man, D.T. Suzuki, later a renowned Zen Buddhist scholar, worked at Open Court for eleven years as a translator and researcher. 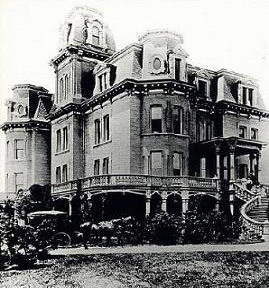 In 1995, the Hegeler Carus Mansion was added to the National Register of Historic Places, the official list of the nation’s cultural resources worthy of preservation. The shop features local artists’ work as well as fine antiques.